Sales of new cars and trucks plummeted 32% in October, dropping to levels last seen during the deep recession of 1975, as credit-tightening and recession fears kept buyers away. Ford, Chrysler, Nissan, Honda and Hyundai, which with GM and Toyota account for more than 90% of the new cars sold in the U.S., each reported sales declines of more than 25%. Mercedes-Benz saw its sales drop 35%, while BMW fell 14%. Only Audi posted an increase in sales last month. In response, desperate carmakers are now talking about asking Congress for new tax incentives, such as making interest on car loans deductible or granting tax credits for scrapping old cars  moves designed to encourage consumers to purchase new vehicles. And it's not just Detroit that's hurting. "We would be in favor of some kind of action if it was across the board," says Irv Miller, vice president of public relations for Toyota Motor Co., which saw its sales drop 26% last month in spite of ongoing zero-interest financing deals. 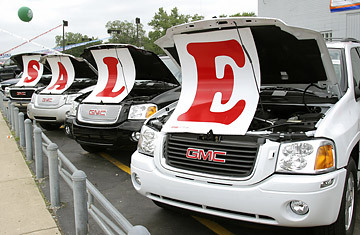 Carmakers are also moving up year-end-sale promotions in a bid to get consumers back to the showroom. "We'll see the year-end events start as soon as the election is over," says Jim Farley, vice president of sales and service at Ford Motor, where sales dropped 30% last year. Auto executives, though braced for hard times, were clearly stunned by the latest data. "If you adjust for population growth, this is probably the worst industry-sales month in the postWorld War II era," says Mark LaNeve, vice president of sales for General Motors, the nation's largest carmaker, which reported a 45% drop in sales. "In my 27 years, I never saw a month like this. It was like somebody turned out the lights." Mike DiGiovanni, GM executive director of market analysis, says that in absolute numbers, sales of 851,000 units in October were the lowest since the autumn of 1975. "We did not see this big a decline coming for October," he adds. "The financial crisis is now being fully felt on Main Street," he says. "Clearly we're in a very dire situation," notes DiGiovanni, who adds that the company's sales have fallen a third from their peak in 1999 and 2000.